The Santa Cruz Enduro Challenge will be heading to Bright in Victoria for a full weekend of racing from Feb 13-14. 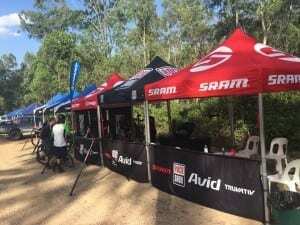 The event also forms round 1 of the Australian Enduro Series so be sure to save the date and register early so you don’t miss out! Congratulations to everyone who participated in the 2016 Santa Cruz Enduro Challenge. Results are now available for download below. Due to predicted extreme weather forecast for Saturday February 13 and the associated fire risk across the commercial forest areas. The organisers of the Santa Cruz Enduro Challenge have taken steps to cancel practice and racing on Saturday. This decision has been taken in consultation with the land owners, HVP Plantations land managers, Alpine Community Plantation who will publish their official fire ratings later today. As a result, the racing schedule on Sunday has been adjusted to allow for practice and racing to occur on one day. Blue Dirt Shuttles will be providing shuttles on Sunday between 6am and midday. 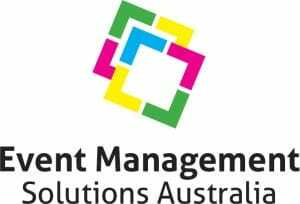 EMS Australia will cover all costs associated with providing shuttles. Everyone who has pre-purchased shuttles will receive a refund from Blue Dirt early next week. Due to the large number of riders it is expected that there will be delays on the shuttle service. Riders are encouraged to arrive early. It is advisable to practice the lower stages (4 and 5) by pedalling as this will be a more efficient use of time. 12:45 Rider briefing at event village. 1pm Racing begins from event village. In order to fit all riding in for the day, stage 3 will not be run. Riders will also be able to race in the “scatter” format, where stages can be ridden in any order. A time limit to complete all stages will be advised at the rider briefing. There will be no prologue stage. Riders will start as per their 2015 National Enduro Series rankings within their category. Looking for something to do on Saturday. Blue Dirt Shuttles will be running a service at Falls Creek. 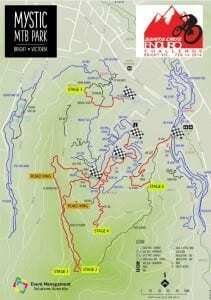 Santa Cruz Enduro Challenge riders will receive a discounted rate of $30 (normally $50) for a day at Falls Creek where the temperature is forecast to be a refreshing 23 degrees. This shuttle service is not sold out and is open to all riders. The adventure film festival is also in Bright this weekend and will have screenings throughout the day as well as night time screenings in Howitt Park on Friday and Saturday nights. We thank you for your patience and understanding in this step that has been taken with rider safety in mind. Are you volunteering as part of a group? If yes please specify. 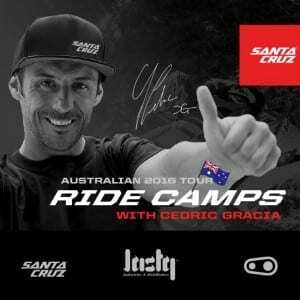 World Champion Mountain Bike rider Cedric Gracia will be conducting his popular CG Fun Camp Feb 10 & 11 in Bright, Victoria. Each day 20 riders will be given the opportunity to ride with Cedric, learn skills, and hear about his experiences over the last 20 years on the international Mountain Bike Circuit. The Camp will utilize the Mystic Mountain Bike Park then before heading back to to Bright’s iconic brewery to celebrate. Entries are only $200 so head on over to the event website so you don’t miss out! The Santa Cruz Enduro Challenge will be held in Bright, Victoria. This is a popular location for summer travelers due to it’s beautiful scenery, attractions and of course great trails! Find out everything you need to know about travel, accomodation and more below. For more information on the area please visit the official Bright Visitors Page. There are two airports within driving distance to Bright, Albury and Melbourne. If you are looking to fly in for this event the closest option is Albury airport which has daily direct flights from Sydney and Melbourne. Check out Bright, Victoria’s official visitor page for a comprehensive breakdown of what’s available. Bright has a large selection of bakeries, cafe’s and restaurants. A local favourite is the award winning brewery located in the heart of town. While the Santa Cruz Enduro Challenge will be taking place in summer Bright can still get cold at this time with temperatures ranging on average between 10-30 degrees. Temperatures in Bright are generally two degrees lower than Wangaratta and Albury and high country temperatures often up to ten degrees or more lower than the valleys. Ensure you come prepared for possible weather conditions. For local weather forecasts check the Australian Bureau of Meteorology website. DOWNLOAD THE OFFICIAL COURSE MAP HERE! Blue Dirt Mountain Biking will be operating shuttles the weekend before on February 6 & 7. They will also be providing shuttles on Saturday 13th for participants that are looking to get additional practice in before the Prologue. Please note that NO private shuttles will be permitted in the Mystic Mountain Bike Park over the event weekend so if you want a shuttle during practice you will need to book with Blue Dirt. There is a limited capacity for these shuttles so make sure you book online to ensure you don’t miss out. Bookings will close a few days out from the event. Registrations for the 2016 Santa Cruz Enduro Challenge will open on January 1st. Get in early to make sure you don’t miss out! Book a space in the Event Village! For teams and clubs that want to secure some prime real estate at the 2016 Santa Cruz Enduro Challenge, you’ve come to the right place. Spaces within the event village are available to those looking at setting up a team marquee, pit space, activation etc. You have the option of booking either a 3×3 or 6x3m lot. Each space will be available for the entire event weekend so that you can make the most of your time at the Santa Cruz Enduro Challenge. Fullface Helmets are compulsory on all special stages, as per standard A in the MTBA guidlines below. A helmet must be worn at all times including liaison stages, they must also be secured properly at all times. We also highly recommend riding gloves, knee pads, back and neck protection. Riders will have a non-competitive liaison stage between each of the timed sections. Results will be based on the total cumulative time across the stages. The lowest time in each category will be the winner. Riders must be stationary, one foot on the ground and within the starting area (no rolling starts) when they start each stage. Riders will start each stage at 30 second intervals in a scatter format for Mt Joyce Race 3. Stages will be taped where it is deemed appropriate. Taping will leave suitable line choices where possible, but it will not allow for any significant ‘cutting’ of race stages. Where course tape is only present on the outside of a corner, this defines the route. Results are based on the total cumulative time across the stages. The lowest time in each category will be the winner. In some cases (e.g. you have stopped to assist an injured rider) a derrived time may be allocated to you for a stage. Penalties can also be allocated if riders do not adhere to the race guidlines or information given during the rider briefing on event day.